From left: The holiday lighting at Far Niente Winery in Oakville, Napa Valley. A tasting seminar at the Ahwahnee's Annual Vintner's Holiday Events at Yosemite National Park. SAN FRANCISCO — Nothing pairs better with the holidays than a California wine country getaway. From a tour and tasting at a winery that specializes in sparkling wine, where you can stock up for New Year's, to a delicious restaurant meal or a hotel fireside snuggle topped with a sweet dessert wine, California's distinctive regions and wines can help you turn up the merrymaking. To help travelers with their holiday wine getaways, Wine Institute has put together highlights of California wine country celebrations, from special tastings and unusual pairing experiences to Black Friday parties where you can find gifts for the wine lovers in your life. For more details and tips on California wines, wineries and wine regions, check out the state's official source at www.discovercaliforniawines.com. California’s North Coast enchants with rolling hills dotted with vineyards, thundering waves and towering redwoods. With one of the coolest climates in the state, this region is home to about half of California's 3,800 wineries. Wine and food lovers enjoy pairing their wines with the region’s artisan foods, from olive oil to goat cheese, giving them a truly local connoisseur experience. 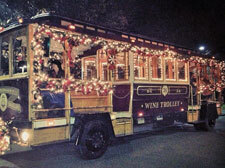 Sonoma Valley has a holiday wine trolley that takes visitors to wineries throughout the valley. Throughout December, wine lovers in Sonoma County can vote for their favorites in the 8th Annual Sonoma Valley Gingerbread Winery Contest, where more than a dozen wineries create and display amazing gingerbread replicas of their winery buildings. While in the valley, leave the car behind and taste with the Sonoma Valley Holiday Wine Trolley, brimming with garlands and lights. You'll tour historic landmarks and four beautifully decorated wineries while listening to classic holiday music. Wine lovers looking to impress their friends should try the J Vineyards & Winery Chef Cooking Series – Holiday Edition: New Year's Eve Fare on Dec. 14, where they will learn how to create three delicious dishes and pair them with wines. Those who crave comfort food can taste to their heart's content at the Dutton-Goldfield Winery's Soup & Pinot event on Dec. 7, or indulge their sweet tooth at the Dessert Wine Holiday Tasting Nov. 30-Dec. 1. Looking for a special stocking stuffer? Take advantage of the Korbel Holiday Shopping Spree Weekend Nov. 29-Dec. 1, featuring holiday gifts, ornaments, and decorations, as well as by-the-case wine specials. On Saturday and Sunday afternoons, enjoy Christmas carolers and a cameo appearance by Santa Claus. Napa Valley fans can hop on the Napa Valley Wine Trolley and explore various wineries or visit any number on their own. Don't miss Robert Mondavi's 3rd Annual Holiday Tree Lighting and Celebration on Nov. 30, which includes a tree lighting party, horse and buggy rides through the vineyard, wine tasting, hot apple cider and carolers. Check out reserve wines and light bites at the Holiday Open House at Beringer Vineyards on Dec. 7, or taste at the Rutherford Appellation Passport Weekend Dec. 6-8, including barrel samples and special offers. In Lake County, named for the largest natural freshwater lake in California, many wineries are inviting wine lovers to venture off the beaten path and experience the area's appealing Cabernet Sauvignons and Sauvignon Blancs during Three Days of Holiday Cheer. 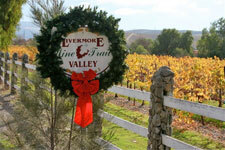 Taking place Dec. 6-8, guests can tour up to 30 area wineries decked out in holiday style. Up in Mendocino County, home to coastal redwood country, BARRA of Mendocino Winery invites guests to the Annual Tree Lighting Celebration on Dec. 6, including a holiday sing-along, Martha Barra's tasty homemade treats, spiced cider and crafts for the kids along with wine tasting for the adults in the beautifully decorated tasting room. Wineries of the Sierra Foothills make the perfect pairing with High Sierra winter resort areas such as Yosemite National Park and Lake Tahoe. Originally home to the California Gold Rush, this region now serves up liquid gold—wines of abundant flavor and variety. Madroña Vineyards’ Christmas in the Cellar event on Dec. 7 in El Dorado County gives visitors the chance to score unique local artisan holiday gifts while enjoying wines paired with savory soups and music. That same day Fenton Herriott Vineyards is hosting a Holiday Cellar-Bration, with special wine and food, while Calaveras County is hosting their Calaveras Wineries Festival of Wines, where wineries offer “get-into-the-mood” holiday music, culinary delights and many regional wines. 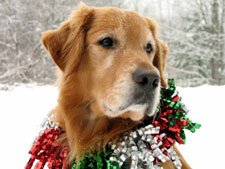 The town of Murphys is participating in this festival with a community-wide Holiday Open House. Amador County’s West End Wineries are hosting a Holiday Open House Dec. 14-15, including Convergence, Drytown Cellars and Sera Fina. That weekend wine lovers can also enjoy the Holiday in the Hills event, with open house festivities at 19 participating wineries along the Placer County wine trail. Not far away is the Ahwahnee's Annual Vintners’ Holidays Events at Yosemite National Park Dec. 1-5, featuring special California wines, gala dinners, and hands-on seminars and receptions with California winemakers. California's iconic Central Coast is famous for breathtaking Highway One drives, Hearst Castle and wine regions with some of the oldest grapevines in the state, planted by Franciscan monks as they made their way north on El Camino Real (“the royal road”, now Highway 101) in the late 1700s. Stretching from the Golden Gate Bridge south for about 300 miles, the region produces excellent diversity in both wine and surf. The area boasts abundant agricultural counties with artisans crafting signature olive oils, cheeses and unusual items such as fingerlimes and Morro Bay avocados—which can be found in dishes paired with regional wines. In the east San Francisco Bay region, Captain Vineyards is offering the perfect way for serious wine lovers to celebrate the holidays—a Vine to Wine Class on Dec. 8. The session includes how to distinguish grape varieties in the field and in the glass, plus a barrel wine tasting with the winemaker and cheese pairings. Livermore Valley wineries are hosting a Holiday in the Vineyards event, an open house with special wines, local crafts, barrel tastings and Toys for Tots donations and pictures with Santa. Wente Vineyards is participating in the open house by offering a Thanksgiving Take Home Dinner on Nov. 27, a Holiday Take Home Dinner on Dec. 24 and a Gingerbread Class and Wine Tasting on Dec. 3. Nearby Murrieta’s Well is hosting a Holiday Preview Weekend Nov. 29-Dec. 1 and a Build A Basket event Dec. 14, the latter of which lets guests create their own gift basket with special gourmet items. Santa Clara County, located in the south San Francisco Bay area and home to much of Silicon Valley, is getting in on the action with special events like the Holiday Wine and Chocolate Tasting at the J. Lohr San Jose Wine Center on Dec. 8, and the J. Lohr Holiday Feast with Chef David Page Dec. 14-15. Emilio Guglielmo Winery's 25th Annual Holiday Gift Faire in Morgan Hill on Dec. 14-15 lets guests shop for gourmet gifts, while enjoying light bites, hot mulled wine and carolers. Just above the charming wine country town of Los Gatos, wine lovers can enjoy A Mountain Holiday! with The Summit Wineries Dec. 7-8, featuring tastings and more at wineries such as Burrell School, MJA Vineyard, Regale Winery and Silver Mountain. In the Santa Cruz Mountains wine region, Bargetto Winery is hosting Art in the Cellars Dec. 7-8, featuring 26 local artists selling their creations in the historic cellar, paired with wines and hot spiced Chaucer's Mead and the chance to create your own wine bottle label for purchased blends. Cooper-Garrod Vineyard is offering a unique Holiday Open House and Walk with the Winemaker Dec. 7 plus the chance to taste wines paired with an organic Picnic Guild lunch. Those looking for an alternative to Black Friday shopping can check out the Art, Wine & Gift Bazaar with The Surf City Vintners on Nov. 29, featuring handcrafted local gifts paired with wines. Those traveling to Monterey County this season will want to savor Chateau Julien Wine Estate’s Holiday Spectacular on Dec. 8, showcasing an a cappella choir and wine reception in the chateau. In Paso Robles—just named Wine Enthusiast’s 2013 Wine Region of the Year—Eberle Winery is hosting a Black Tie Holiday Dinner in the Caves on Dec. 7, featuring cuisine by nationally renowned celebrity chef Michel Richard paired with beautiful holiday décor and wines. Robert Hall Winery is hosting an Annual Holiday Sale Nov. 29 and a New Year's Eve Mad Men Style party on Dec. 31. Vina Robles—which recently debuted a new amphitheater for enjoying wines with music—is hosting Christmas Cookie and Wine Pairing Dec. 19-22. They're also hosting an Illuminating Evening & Wreath Making Party on Dec. 7, complete with tree lighting ceremony, food, Santa visit and a special musical performance by the Atascadero Fine Arts Academy. Nearby on the coast in San Simeon, the Hearst Castle Holiday Feast—spotlighting local wines such as Hearst Ranch Winery’s—recreates the glamorous times when luminaries gathered in William Randolph Hearst's hilltop home, tasting the best of the good life. In San Luis Obispo County wine country, Talley Vineyards will host a Holiday in the Tasting Room on Dec. 6, giving guests the chance to enjoy wine tasting while buying holiday gifts from local artisans. Santa Barbara County—whose Pinot Noirs were put on the map in “Sideways,” is also hosting events, including the historic Danish town of Solvang, where streets are transformed into a holiday postcard. Named by Time magazine as the "Most Christmas-ey Town in the U.S.," Solvang is a great place to celebrate wine-centric events such as Lucas & Lewellen's Jule Fest Christmas Open House on Dec. 6, which features a special tasting of Christmas wines paired with gourmet cheese and chocolate selections. The following weekend, the Solvang Julefest - Holiday Wine Walk on Dec. 14-15 is a great way to taste 13 wineries’ offerings in a short downtown walk. "Paint Your Pet" party at Woodbridge by Robert Mondavi Winery. In the San Joaquin Valley, known as the food basket of the world, Woodbridge by Robert Mondavi is hosting a Bubbles n' Bites - Meet the Winemaker event Dec. 6, featuring conversations with their winemakers, hors d’oeuvres and great wines. That day they're also offering a “Paint Your Pet” party – where you create a portrait of your pet -- complete with winetasting. Although Southern California is famous for surfing and celebrities, the area boasts hidden gem wineries and vineyards tucked into rolling valleys and foothills. Midway between Los Angeles and San Diego is Temecula Valley, where the warm climate is tempered by coastal fog, creating delicious Italian and Rhône varietals. Leave the Thanksgiving cooking to Ponte Winery's Bouquet Restaurant on Nov. 28 or skip the morning rush at the mall by going instead to the winery's Black Friday Shopping Night Nov. 29. Those who can't finish their shopping in one night can try again at Ponte Winery's Holiday Shopping Sundays, where wine lovers can taste while buying on Dec. 15 and 22. Also in Temecula, South Coast Winery and Spa has teamed up with the Temecula Carriage Company to create fabulous horse-drawn carriage vineyard rides for its guests throughout December, featuring jingle bells and decorated horses in vintage-style holiday splendor. Don’t miss the winery’s Tree Lighting Ceremony on Dec. 1, where they’ve decked their halls and vineyards with hundreds of thousands of holiday lights and are offering holiday movies, hot chocolate, tractor rides, strolling Christmas carolers and more. Visitors also can enjoy wine-centric Christmas Eve and Christmas dinners at South Coast Winery’s Vineyard Rose Restaurant. Revelers can ring in the New Year Dec. 31 at the restaurant’s Black Tie & Pearls New Year’s Eve Extravaganza. Napa Valley can also be experienced without a trip north at Far Niente Winery's special wine dinner Dec. 5 at Newport Beach’s 21 Oceanfront Restaurant in Orange County. For more ideas on wine tasting and other activities in California wine country during the holidays and beyond, go to Wine Institute's website at www.discovercaliforniawines.com. Wine Institute is the association of 1,000 California wineries and wine-related businesses dedicated to enhancing the environment for the responsible production, consumption and enjoyment of wine. California is the fourth largest wine producer in the world, making 90 percent of all U.S. wine and three out of every five bottles enjoyed in the U.S. Each year, 21 million tourists visit wine regions throughout the state to explore and enjoy the wines, the cuisine and cultural offerings associated with California’s signature industry.